Brugge is full of charm. It's clean, the houses freshly built, painted or sand-blasted (they're mostly brick). Experienced travelers are occasionally negative over the qualities of a place that's been rebuilt and gussied up for tourists, but the world changes and tacking on the charm for the tourists will likely never stop. But still, a walk along a tree-lined canal bordered by evocative buildings without a lot of car traffic has its charm, and Bruges has it in spades. Besides, these days you can get that medieval flavor of Brugges without the cholera and other bugs that lurked in the canal water in those ancient times. 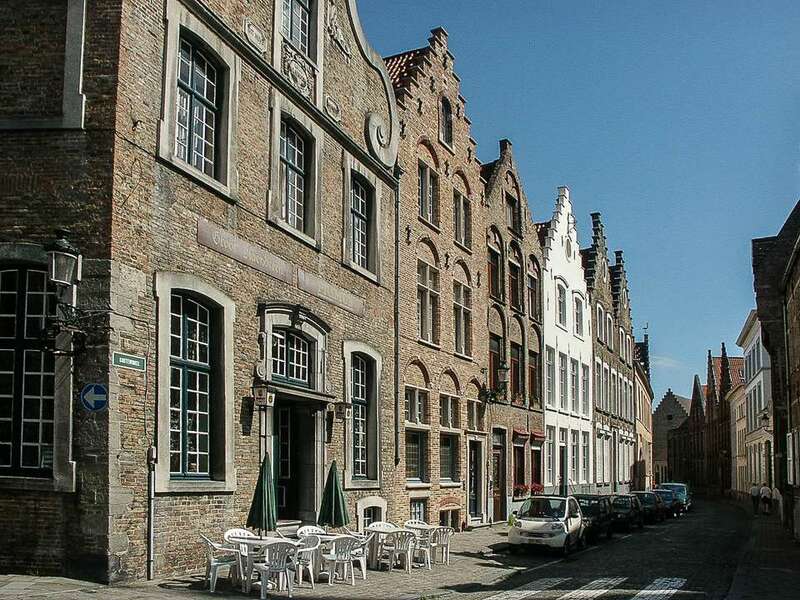 Brugges has been a UNESCO World Heritage Site since 2000. The bad? Prices of a restaurant meal are quite high; it seems prices are about 40% cheaper in Gent. But that's what you pay when the tourists outnumber the working folks. Brugge was once known for its lace making, and a small and inexpensive lace museum is worth a visit. The old laces were unbelievably detailed and complex. If you go at the right time, there are women there who will demonstrate the craft, although not nearly to the level of detail as the old work. The Basilica of the Holy Blood, holding the relic of the holy blood that was brought to the city after the Second Crusade by Thierry of Alsace, is a popular place of pilgrimage. The blood is on public display during the procession of the Holy Blood on Ascension Day in May when nearly 50,000 people crowd the city. The lower chapel is pretty much unchanged from the 11th century. There is also a small brewery museum; you can see how many breweries Brugge had in the past and see the process of making beer. Afterwards, they'll pour you a free brew of your choice. A very cute hotel in a great, quiet location near a canal is the Hotel Adornes. The Bauhaus is the budget choice, a hostel that also rents out apartments. If you need to have a hotel near the station at a reasonable cost, the Hotel ibis budget Brugge Centrum Station is quite highly rated. Gent and Brugge have changeable weather so plan accordingly. Go to the Belfort and take the trip up to the top. But don't just go any time. On ten after the hour, they give tours in four languages (English is one of them) and this one is not to be missed. You'll learn a whole lot about Gent history, and not just the dry facts. You'll see the mechanism that drives the 49 bells (think gigantic music box here). And if you wondered why there are a pretty girl and a lion on each bell, well, that's the symbol of Gent that came about when the city fathers commissioned an artist to create a symbol of "power" for the city. Evidently, the word for "power" and the word for "virgin" were almost identical, so the artist heard "virgin" as artists do, and off he went to paint one scantily clad. The lion was evidently added later to appease the fathers. And to top it all off, there's a view of the whole city you won't forget. The Ibis Centrum offers rooms in a central location near the cathedral and has decent prices for Gent. For those who like small apartments, the highly rated Aparthotel Castelnou might fit the bill. Tourist information has a wonderful book of bed and breakfasts with many pictures, so you might want to check that out. It's behind the Belfort. Yes, it's all about beer in Belgium, although wine and soft drinks of all kinds are available. Each style of beer is served in its own type of glass - and there are many styles to choose from, some of them pushing the ability of yeast to ferment without killing itself from the alcohol it produces - some beers come in at over 10 percent. Bruges, Belgium: Beer, Chocolates and More! Have Two Weeks in Ireland? Then Visit the Best Sights in the South! The Ultimate Colombia Itinerary. Here's What to Do in 2 Weeks.